Help and support when you are faced with the loss of your cat. 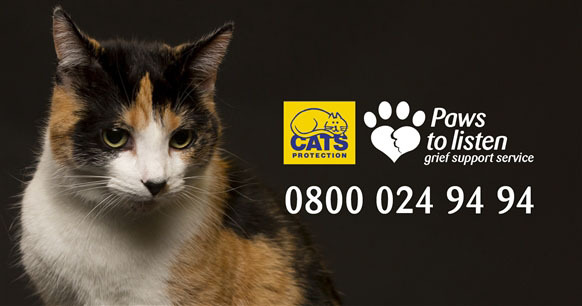 Cats Protection are there for you if you are heartbroken over your cat passing away, or if you need to speak to someone about the difficult issue of euthanasia, or if your cat has gone missing and you need to speak to someone about your loss. Cats Protection understands just how much your cat means to you and what you may be going through if your pet is missing, had to be rehomed, nearing the end of their life or they have recently passed away. There is a range of resources, information and support to help you at this difficult time. Coping with the death of a beloved cat or struggling to handle your grief after they’re gone: losing your cat can be devastating. It can affect you and your whole family. If you are struggling with any issue surrounding the death of your cat, we hope you find the practical information and advice on this page both helpful and comforting.